when you arrive at your destination? View from the swing in my backyard. fought to bring them to fruition. I counted down for 572 days. Here we are! Incredible how quickly hours fly by when they’ve been anticipated for 572 days! But each hour so anticipated is to be savoured and enjoyed for 572 days to come, and then beyond. Over the last few years, we’ve had the opportunity to visit several basilica and cathedrals in Italy and France. These huge edifices dedicated to the glory of God, all share one commonality: the architects and builders who began the project did not get to see it completed. Building a cathedral is a gift to the future that you will never see. This thought first occurred to me when I read Ken Follet’s Pillars of the Earth, but it has been reinforced by recent experience. Take La Sagrada Familia in Barcelona, Spain, for example. The project was begun in 1882. 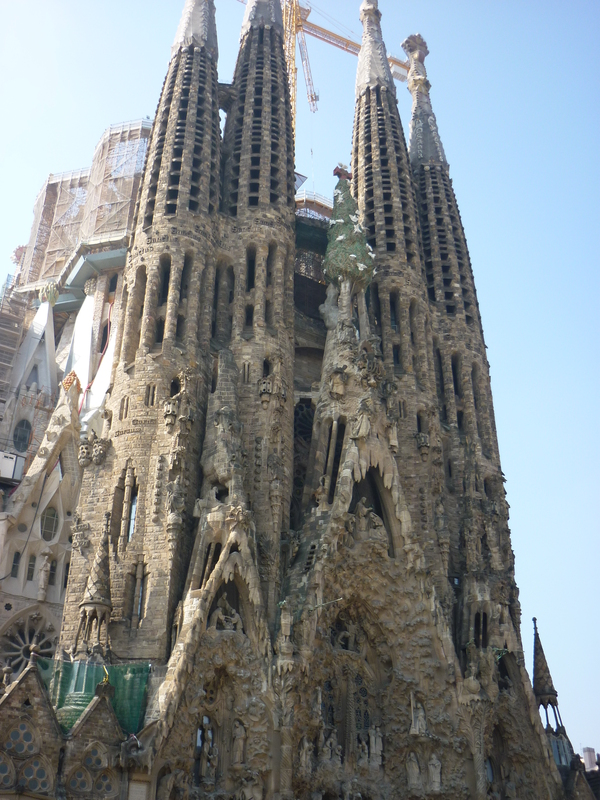 The initial architect retired in 1883 and Antoni Gaudi took over. He was so dedicated to the project that he moved in, and had a bedroom in the church. He died in 1826. In the book, The Gaudi Key, I read that he was hit by a tram, and he was dressed so poorly that he was presumed to be homeless, and taken to a pauper’s hospital. When he was found, he refused to move, and he died there. He had spent over 40 years building the church at that point, and he remains there, buried in a crypt under the high altar. In keeping with Gaudi’s style, La Sagrada Familia is a very organic building. Animals and nature abound. Some of the spires seem to have been inspired by termite nests. Trees sprout from others. 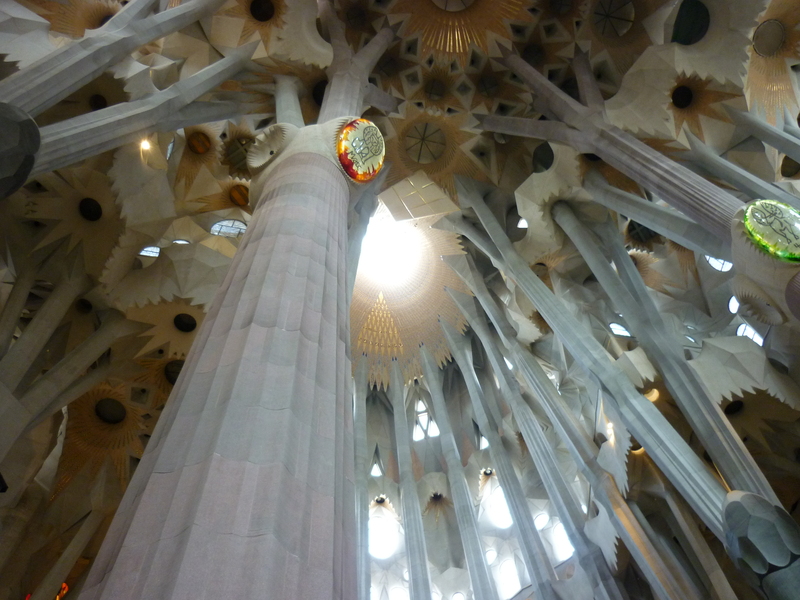 The columns supporting the roof are like primeval trees. The ceiling has parabolic circles Gaudi intended to improve the acoustics of the choir loft, which was built for 1000 choristers. It takes a special kind of vision to look into the future and begin building a cathedral. La Sagrada Familia is scheduled for completion in 2026, in time for the 100th anniversary of Gaudi’s death. The project is completely financed with donations and entry fees to the church. We bought our tickets and climbed the stairs of those spires. We contributed a little bit to the building of a cathedral, a little nod to the future whether we are part of it or not. Great projects are begun by simple men. When others assume the vision and accept the challenge, the baton is passed, and great accomplishments can be achieved.